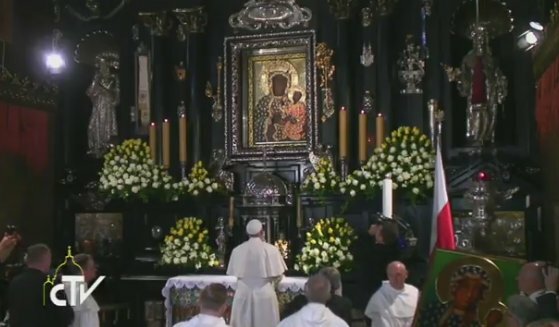 #PopeFrancis at Jasna Gora calls St. John Paul & St. Faustina "meek & powerful heralds of mercy." A son's gaze & gift of gold rose for Our Lady of Czestochowa. #PopeFrancis. 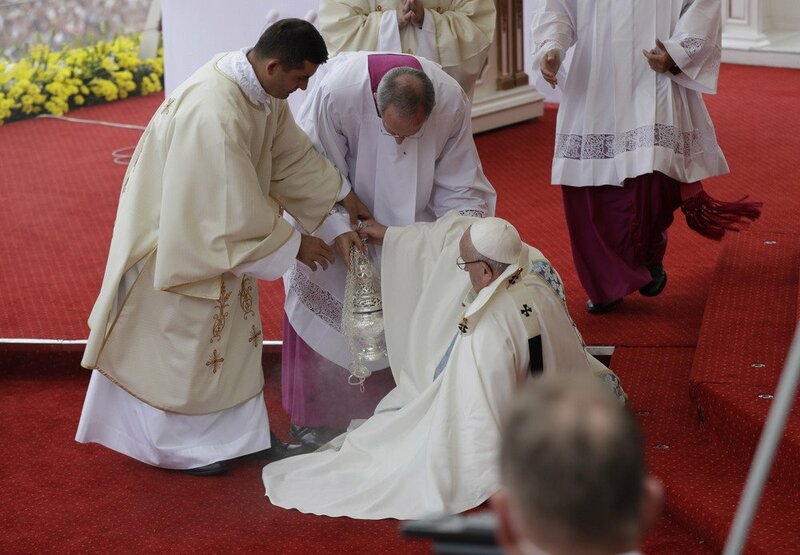 Pope Francis falls July 28 after tripping on a shallow step as he was celebrating Mass at Poland's most revered Catholic shrine during his World Youth Day visit. The 79-year-old pope quickly resumed walking and showed no evidence of injury. (Vatican Radio) Pope Francis told hundreds of thousands of World Youth Day pilgrims on Thursday to share God’s merciful love by building bridges and by tearing down barriers, walls and barbed wire. 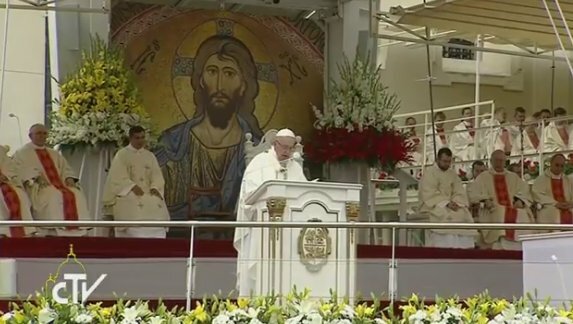 Speaking during a welcome ceremony in the giant Blonia Park, close to Krakow’s city centre, the Pope said "mercy has a youthful face" which can move us beyond our comfort zones and make us ready to embrace everyone. A merciful heart, he said, is able to be a place of refuge for the homeless, sharing bread with the hungry and welcoming refugees and migrants. Recalling the legacy of Saint John Paul II, who began the tradition of World Youth Days, Pope Francis praised the “enthusiasm, dedication, zeal and energy with which so many young people live their lives”. He warned them not to be tempted by “dark paths” or to “run after peddlers of fond illusions”. Instead, he urged them to be like Mary, Martha’s sister in the reading from St Luke’s Gospel, who made space to listen to Jesus in the midst of her busy life. The Pope told the young people to imitate Mary of Bethany and Mary of Nazareth by welcoming Jesus, by helping the poor and by listening attentively to other cultures and peoples, "even those we are afraid of because we consider them a threat". Young people on Thursday evening chanted and sang songs awaiting Pope Francis to come to the window of the Archbishop’s residence in Krakow and when he came out, the Square below erupted with cheers. The pope said that he sometimes is asked how married couples can surmount varies difficulties and he suggested that three words are always used, pardon, thanks, and forgiveness. 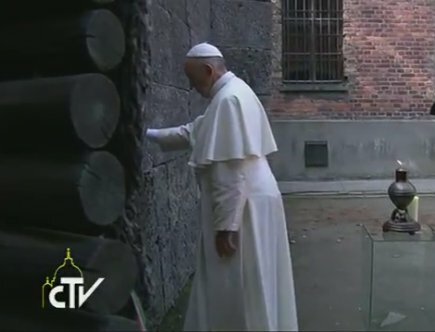 (Vatican Radio) Pope Francis on Friday morning paid an emotional visit to the Auschwitz-Birkenau memorial and museum, the site of a Nazi concentration and extermination camp where more than 1.1 million people, mostly Jews, were put to death during the Second World War. For the Pope, this visit to the former Nazi concentration camp at Auschwitz-Birkenau was to be one of silence and prayer. The only sounds to the heard were the shutters of the ever present cameras as a solemn Pope Francis walked alone through the infamous gate that reads “Arbeit macht frei” – “work sets you free”. The Pope was then driven in an electric car to the notorious block 11, also known as the death block where Franciscan priest, Fr Maximillian Kolbe was killed after offering up his life for a complete stranger 75 years ago. You could hear a pin drop as the Pope sat in prayer with his eyes firmly closed in this place of suffering. On a sunny morning Francis, who is the third Pope to visit Auschwitz, walked slowly through the notorious gate of the camp under the Nazi slogan “Arbeit Macht Frei” (“Work Makes you Free”) before sitting down to pray. 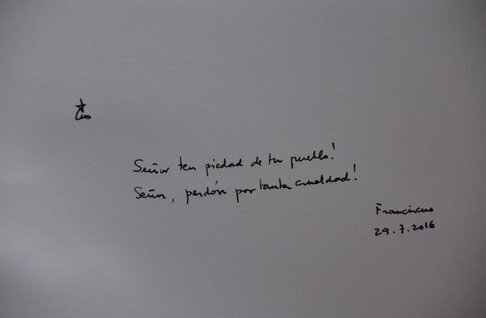 #PopeFrancis in #Auschwitz book: "Lord, have mercy on your people! Lord, grant forgiveness for so much cruelty"
Lighting a candle & praying before the "execution wall" where prisoners were shot at #Auschwitz. #PopeFrancis. 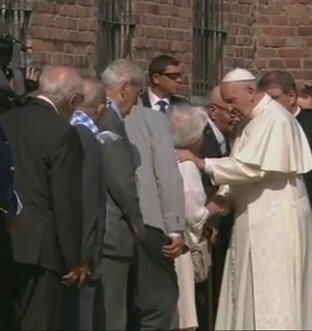 #PopeFrancis greeting survivors of the #Auschwitz death camp. (Vatican Radio)The theme of this Way of the Cross for World Youth Day was the path of mercy and this solemn event opened in Blonia Park in Krakow to the anthem of the Jubilee Year performed by a talented youth orchestra and choir with Pope Francis looking on. In a prelude to the mediations for this evening, a girl in Marian like clothes took to the stage creating a design drawn in sand which revealed the face of Christ. All through the Via Crucis the World Youth Day cross was brought to each station by a different group of young people which included a group of refugees from Syria, a former homeless couple from Poland and nuns from the missionaries of charity; all symbolising the works of mercy. Many of the stops on the way to Calvary were artistically re-enacted through the medium of dance and at the 10th station an acrobat took to the sky where the cloth wound around him fell away to symbolise Jesus being stripped of his garments. (Vatican Radio) Pope Francis told young people that the world needs those who do not live to live their lives “halfway” and who like Christ are ready to spend their lives serving the poorest and most vulnerable. He said the Way of the Cross is Jesus’ style and is a way that fears no lack of success, ostracism or solitude. The Pope was speaking at the conclusion of a Way of the Cross event attended by young people taking part in the World Youth Day gathering in the Polish city of Krakow. During his address to the young people, the Pope had affectionate words of greeting for “our brothers and sisters from Syria who have fled from the war.” The Syrian refugees were among a group of about 20 young people helping to carry the Cross during the first station. The others included a Polish couple who until recently lived on the streets and young people from Italy, Argentina, Ukraine and Pakistan. Recalling his morning at Auschwitz-Birkenau, he said, “how much pain, how much cruelty! Is it possible that we men, created in the likeness of God, we are able to do these things? (Vatican Radio) Pope Francis heard the confessions of young pilgrims to World Youth Day in Krakow on Saturday. The moment of recollection and sacramental reconciliation took place at the Sanctuary of the Divine Mercy just outside the host city on the morning of the penultimate day of the week-long gathering. The Holy Father heard the confessions of five different young people. (Vatican Radio) On Saturday morning, at the Sanctuary of St John Paul II in Krakow, Pope Francis offered the Holy Sacrifice of the Mass for priests, religious men and women, consecrated persons, and seminarians. (Vatican Radio) Pope Francis on Saturday had lunch with a dozen young people serving as volunteers for World Youth Day in the Polish city of Krakow. The private encounter took place in the residence of the Archbishop of Krakow, Cardinal Stanislaw Dziwisz, following a morning Mass for priests and religious in the shrine dedicated to the Polish pope, Saint John Paul II. The young men and women invited to join the Pope for lunch came from all the different continents and included representatives from New Zealand, Zimbabwe, Italy, Columbia, as well as the host nation, Poland. After the meal, they invited him to pose for a selfie with them as a souvenir of this very special occasion. (Vatican Radio) From early on Saturday morning, World Youth Day pilgrims caught trams and buses from central Krakow to bring them as close as possible to the Campus Misericordiae. From there, they walked a further four kilometres to get to these grounds in order to be with the Holy Father at this ever popular vigil. Some of them carried mats to lie on for the long evening ahead, while others made sure they had food supplies to the ready. Under the searing heat of the sun pilgrims protected themselves with hats and sunglasses. There were also sprinkler systems dousing the young people with water and the voice of a loud speaker advised the mass of youth to take advantage of the zones for bottled water. Once inside, the many thousands of young people in the camp joyously waved flags and sang songs, and when the Pope arrived, this field of pilgrims erupted with cheers. One of the highlights of this vigil was when the Holy Father walked hand in hand with young representatives from 5 continents through an especially constructed Holy Door made from ribbons and wood which read, Jesus, I trust in You. Then to their delight and their surprise the group joined Pope Francis in the Pope mobile making their way to the especially constructed alter, a replica of that in Blonia Park. In the second of 5 themed scenes, a video entitled, “hope to those discouraged” showed different images of suffering in the world, beginning with the bombing of the twin towers on 9/11.